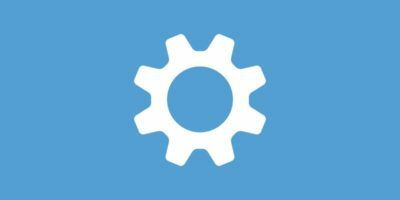 If you’ve ever tried to use an old or slow computer, you’ll know it’s one of the most frustrating things imaginable, as software crawls through the motions or returns the dreaded “Not Responding” message that guarantees to take a few minutes before restoring itself to a working state. Sometimes you want software that demands less resources. 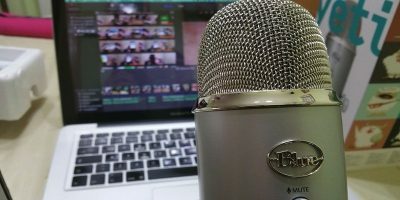 As computers become more powerful, software becomes more demanding to take advantage of this fact. 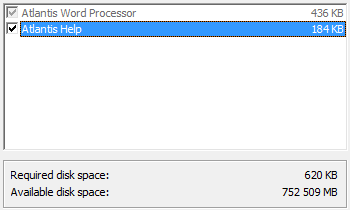 With word processing a key asset, what can you do to help yourself? 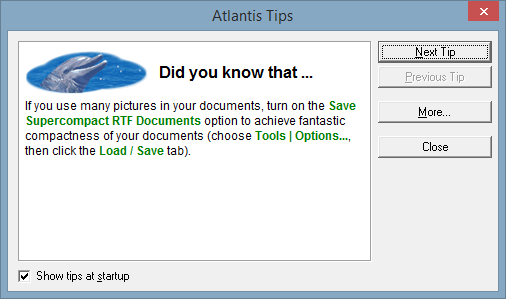 This free word processor for Windows computers is a derivative of its paid relative – Atlantis Word Processor. Atlantis Nova is a pared-back version of the former with fewer features and, theoretically, a smaller footprint. From the moment of install you can be assured that it’s no-frills – but that’s not a bad thing. The installer harkens back to an earlier period in computing, demanding your full screen to go through the process. Among the different screens, there’s one thing that should catch your eye: the complete install size is less than 700KB. Fire Nova up, and you’re not going to experience a revolutionary new UI. It’s grey and it works, and it manages to do something Word does not by including tabs along the bottom for navigating documents. The tab system can be hidden or moved to suit your preferences and is convenient. 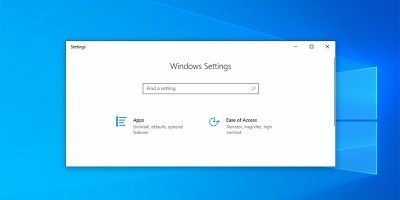 Unsurprisingly there are fewer options in Nova’s settings than there are in Word, but they still grant a satisfactory degree of control over the program. While you might not be impressed with the number of functions available out of the box, the program does support various plugins, so you can expand upon the base program to suit your own desires. For the purposes of this article, we did not add plugins; they may impact on the program’s performance in such a way that it may skew opinions. Nova does particularly well as standard on memory usage, requiring only a few MB of RAM when opened. There is, however, one caveat to Nova you won’t find in AbiWord. 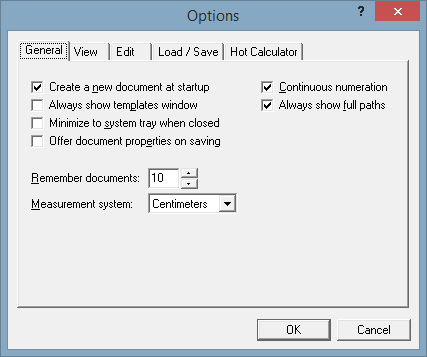 The program’s file type options are restrictive, unlike its paid sibling. 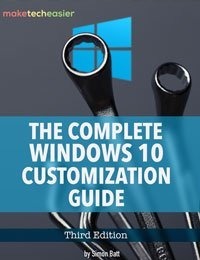 The free version does not support the .doc or .docx file formats which are standard in Microsoft Office. The closest option would be .rtf, which WordPad can also deal with, though it lacks extensibility and requires more RAM. 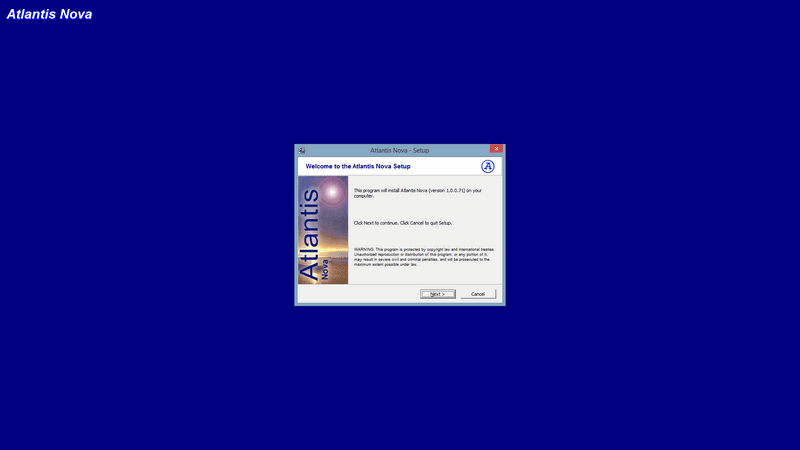 In addition, Atlantis Nova breaks the traditional Windows design of three buttons in the upper right of each window, adding a fourth. 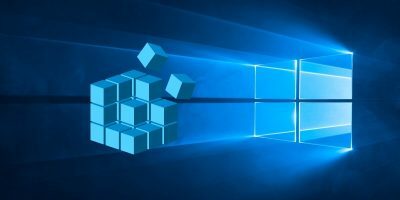 Microsoft breached the same convention with Office 2013, so it’s hardly an unforgivable sin. The new button simply closes the program to the System Tray, an odd feature that may appeal to some users. 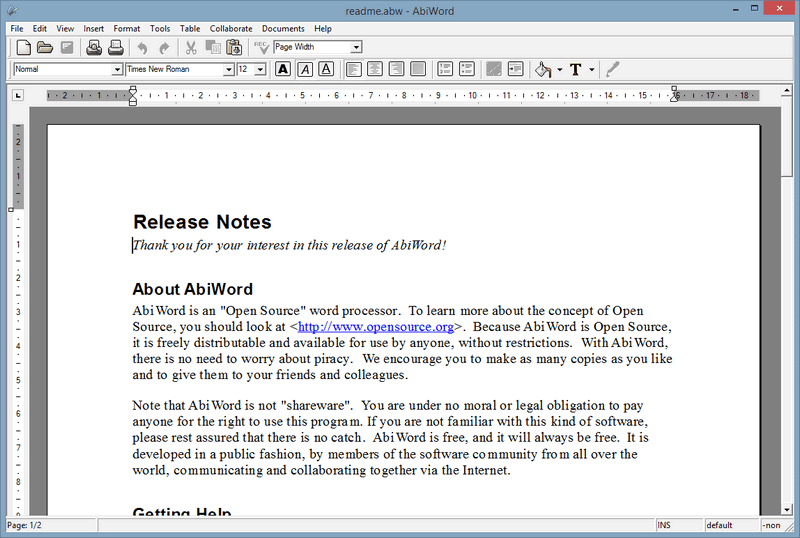 AbiWord is probably the more well-known of the two programs, and it is an entirely standalone, free project. There is no paid version of the software, only the ability to donate and fund future development. The program is lightweight, but the “typical” install option is substantially larger than that of Nova, coming in at 22MB. Neither are likely to put a sizable dent in your available hard drive space, but there is undoubtedly an increase, a testament to both the capacity of modern computer hard drives and the size of Atlantis Nova. 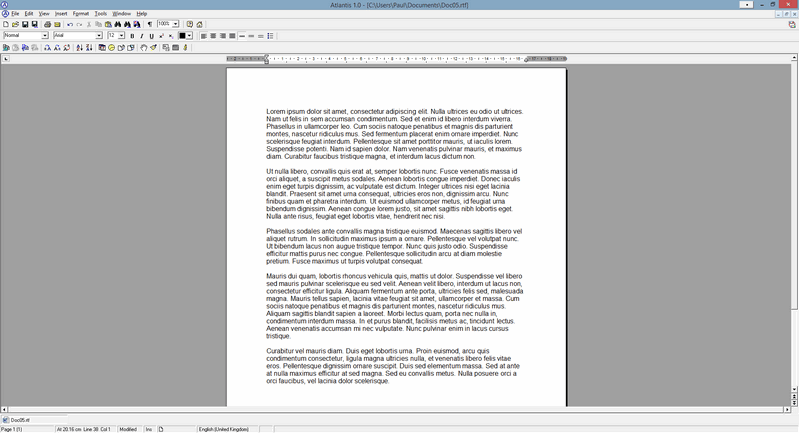 AbiWord’s UI is relatively comparable with that of Nova. Again, it’s primarily grey, invoking memories of Microsoft Office’s UI circa 2000. The program is a little more faithful to old Windows UI conventions, with three buttons in the corner. Font selection is arguably bested only by LibreOffice and Microsoft Word, giving a little preview of the font looks alongside its name. It is a convenient feature if you wish to format your documents in a specific manner. Online office suites have offered collaboration on the same file, and AbiWord has entered the fray with a “Collaborate” button among its menus. It requires an AbiCollab account, but these are free to make and could prove a useful way for collaborating on documents with friends, particularly if you do not like using traditional online suites. 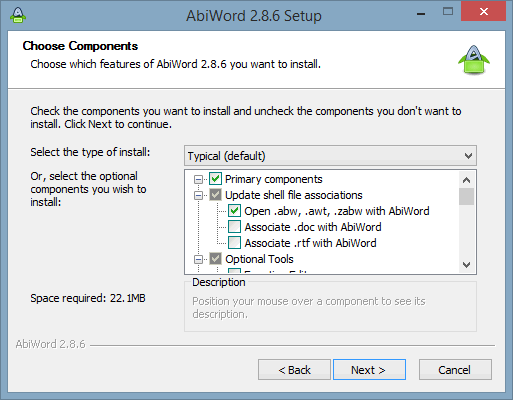 AbiWord also includes a number of other features associated with word processors, including a mail merge. While this might be more than you want to use the program for, it is reassuring to find that it should cover these needs well. 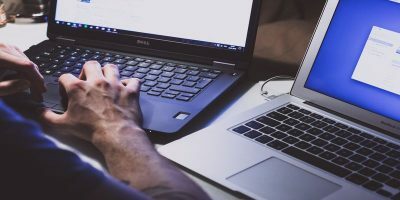 If Nova strikes a balance between a traditional word processor and a rich text editor like WordPad, there can be no doubt that AbiWord is a word processor in every sense. 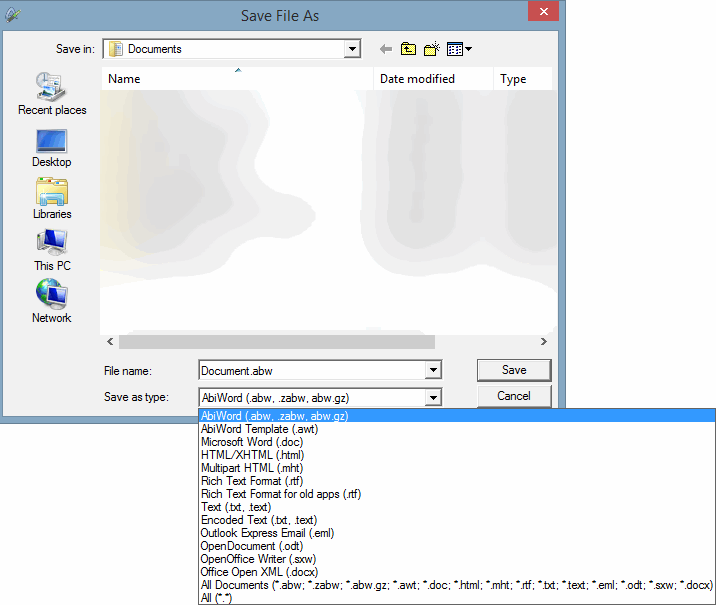 The program includes support for a number of file types, including their own .abw extension and .doc. If you’ve used Office 2007 or newer, you’ll know .doc was the file format used from 1997 until 2003. It’s not an especially new format, but it is widely accepted and works well. Unfortunately the same compatibility does not exist with the .abw file format. Office simply does not recognize it. This is easily mitigated by saving any files in the .doc format, and it’s an easy sacrifice to live with, as AbiWord runs well on the majority of computers. In our testing, the program was quite happy to consume only 5MB of RAM and still run quite contentedly. The market for word processors hasn’t changed an awful lot in the past few years; the only concession in the market has been OpenOffice to LibreOffice, yet both projects are still developed. AbiWord and Atlantis Nova might not be reinventing the concept of a word processor, and that’s okay. Both programs fill a gap in the market and do so very well. 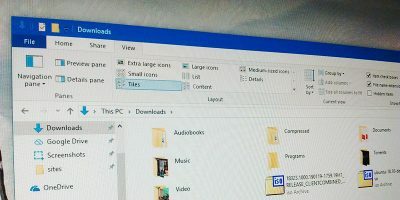 AbiWord is definitely more of a word processor in Word’s vein with its file type compatibility, while Nova can be viewed as a hybrid with a rich text editor. Regardless of which program you choose to use, you should be very content with their performance and functionality. Kingsoft is a pretty decent free Word processor also plus it works on Windows 8.1. I use it all the time. Documents fully compatible with Word so far. Kingston’s cool. It also has a pretty functional and stable alpha for Linux, branded WPS (although with some features missing). 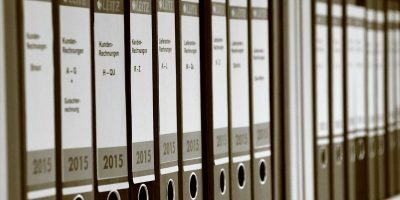 Other advantages to Apache Open Office and LibreOffice is that it CAN read and save as MS Office formats (DOC, DOCX, XFS, XFSX) and is a complete office package, not just word processor. Both are available on multiple OSs (Windows, Linux distros, not sure but possibly MacOS). They do have their own format. But both are extremely extensible with tons of plugins that are universal between the two. And both can export to PDF out of the “box.” With the saving to Office format, it can read and save to previous versions of Office as well. 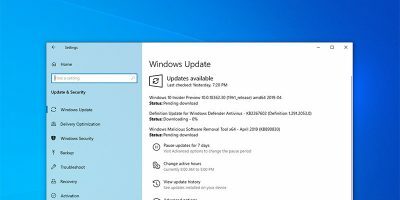 Only issue is that Office doesn’t seemlessly open versions saved from LO or OO, so it would have to be then converted by Office for full use outside Compatibility mode. So not perfect.